Happy weekend my readers! This mornings post features the enchanted and romantic Forest Wedding set from Your Dreams for Deco(c)rate which was released on June 8th. This set includes the ceremony area which is shown and also a very lovely reception area as well. I added the super pretty Fairy Lights from Merak and new Sweet Garden Grass in green from Happy Mood. Newness on me is hair from [elikatira], skin from Glam Affair, shadow from Veechi and pose from An Lar Poses. Hello my lovely readers. 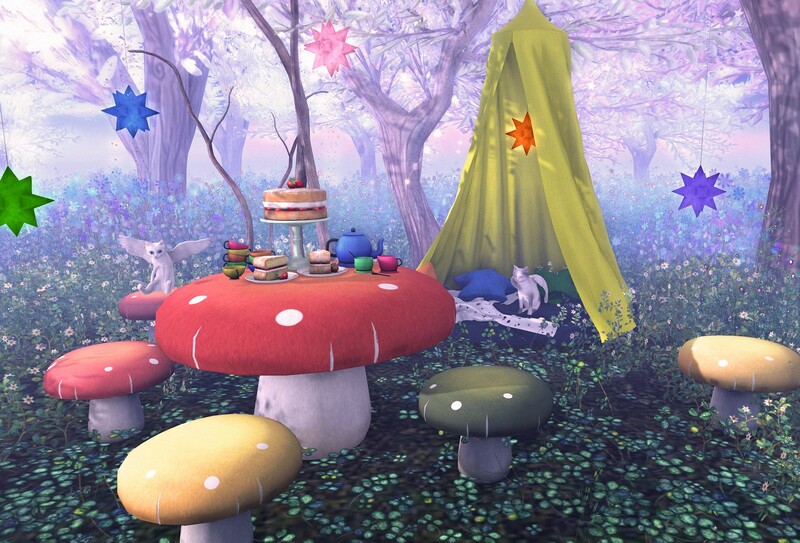 Today I have items from the new April Deco(c)rate which has the theme Alice in Wonderland. I normally do not say it but my absolute fave item from this crate is Chez Moi’s Wonder Tree. It comes loaded with animations, including lots of reading ones and also has books hanging from the branches. It’s perfect for any book lover’s land. My other special mention for this post is from the collaboration from Veechi and Fetch for The Epiphany event. I’m wearing several makeup options from them today in this post, however, you don’t just get a simple makeup hud. Each package also contains a wearable version of the item that has an animation included! Yep, so it can look like you are actually applying the makeup you are wearing. It’s really pretty cool! Hey! Ok, so my mom will be here in about an hour but I managed to find the time to get the pic done and now posted before I vanish for the next week due to RL. This post is Monet inspired since many of the items had the theme for the Home Whimsy event. It was fun because Monet happens to be my favorite artist so I wanted the pic to reflect a more light type of feel. I think my fave thing of all the items are Shabby Tabby’s Watercolor Blooms, they are just so pretty! Bringing some fantasy and whimsy this fine morning with the help of Chez Moi. And what better way to use your large mushroom table set than for a tea party with the super bright tea set from %Percent. I do want to make a special note that the Magical Tent actually comes in black and white, all the color that was added was by me in edit mode, so yes it’s modifiable and yes it’s filled with cute animations for singles and couples.